The LCGS My Page has been designed for coin enthusiasts and provides a variety of on-line services described below "My Page Facilities". 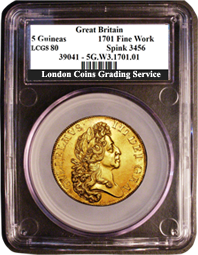 The service is available for LCGS graded and encapsulated coins via the LCGS web site My Page. Illustrated above is a picture of a coin encapsulated in a LCGS holder, on the attribution ticket is the unique identification number (it is 39041 at the beginning of the bottom line), all that is required to trigger this host of useful facilities is a single input of each coins UIN, after the initial input all other facilities occur automatically. Being on-line the system is available any time any place where the internet can be accessed. The system is personalised, secure and password protected. The latest List Price of your collection can be available via your own private internet valuation Screen. The encapsulated coin concept has been around since the 1980s and one of its primary aims is to offer more protection to coin collectors, this is achieved in a number of ways, details of which appear below under Benefits of Grading and Encapsulation. Encapsulated Coins have Their Own Custom Designed storage box, the old problems of cabinet friction, vinyl or plastic contamination and accidental damage are a thing of the past. The following are available free to all LCGS members registered on the LCGS web site. 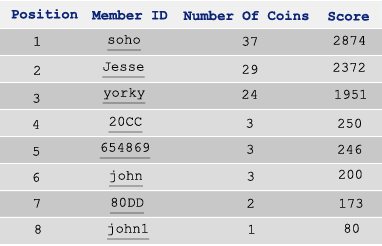 Allows you to input the serial number (UIN) of each coin in your collection, and shows a full list of the collection once logged, which can be sorted in various ways for ease of administration. If any coins are sold off they can be deleted using this option. Displays an on-line image of each coin in your collection, so where a collection has been locked away for security reasons images of each coin can still be viewed. Also if for any reason (insurance claim for instance) proof of ownership is required these images can be utilised. Shows the current valuation of each coin and a total for the whole group based on the latest trend prices monitored and collated by LCGS market observations. The values are updated automatically if and when trends change. These valuations can be printed off and stored for posterity allowing growth over time to be monitored. When a valuation is necessary for insurance or other reasons it is there at the touch of a button, compare this to the situation with a non encapsulated collection where the group would need to be taken to an independent dealer for assessment and valuation. This allows you to appraise the quality of your collection. Having the finest known collection of a given series can often add significant value to the holding as well as providing a sense of achievement. The Collectors Gallery League Tables ranks collections and displays the result in a table. A facility is available allowing the true owner of the collection to remain anonymous. These displays also give a full list of the coins available in all the collecting themes thus providing an ideal wants list and coin collection administration tool, coin varieties are included and their descriptions are a mouse click away. All coins graded by LCGS have a unique identification number the input of which via the coin verification service displays the following information: coin description, variety description, standard catalogue references, provenance, grade, ranking and current list price valuation. Some collectors may put together a fine group of their chosen series and having achieved the goal of having the finest known collection of a given series may wish to move on. They may log the collection for posterity onto the Hall of Fame. Here it will remain until toppled by a better group (regardless of whether the collection is sold on). 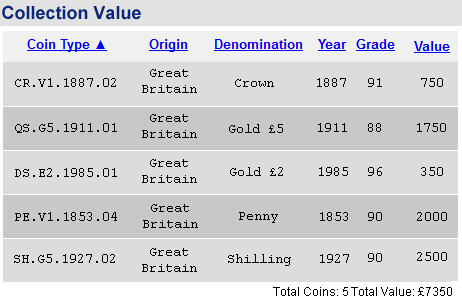 The individual coins logged can also have the collector's provenance added. Do you have the finest collection of your chosen series? Below we see that at the time of writing the member with pseudonym SOHO had the finest recorded collection of Victorian Pennies. 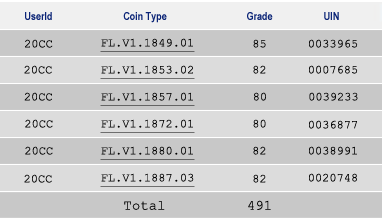 The SOHO score of 2874 is the total of the numeric grade of his/her Victorian penny collection. Coins 78 and above fall into the uncirculated range, they may have bag marks, cabinet friction, toning or other signs of slight mishandling whilst in collections evidence of which will lower their grade, but essentially they have been assessed as having no wear consistent with being in circulation. Anything above 80 will be exceptionally nice what dealers often term gem or choice and consequently scarce and desirable. If you have LCGS encapsulated coins in your collection log them onto the LCGS My Page and enjoy these free facilities. If your collection is made up of non encapsulated coins why not submit them to LCGS for encapsulation. As well as the My Page facilities which are free to all LCGS members there are a host of other benefits to grading and encapsulation.